Here’s 5 quick examples from the Higher Education social media landscape to help you spark your own ideas for communicating with students, alumni and various communities. Have a look at how MIT and Cornell in the US came together to create some noise online. 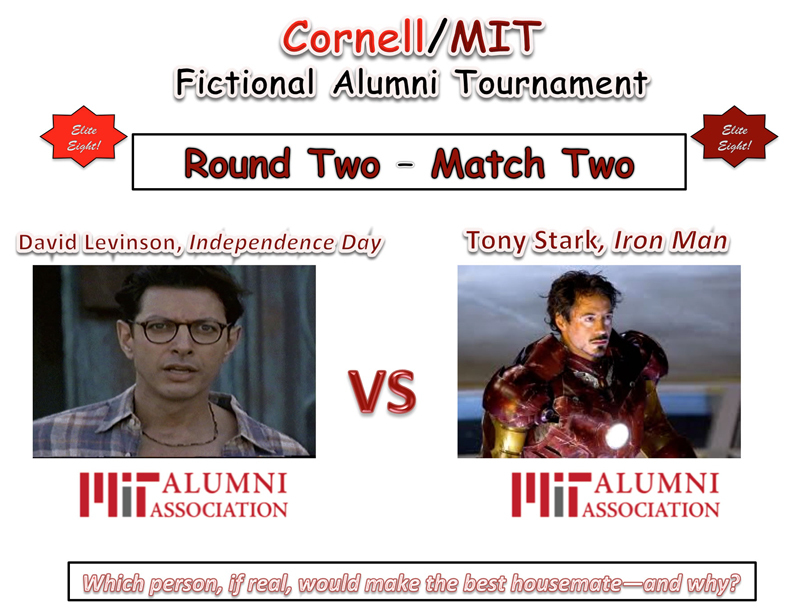 This face-off between fictional alumni provides a little fun in the world of social media engagement. Have a look at how the Iron Man Tony Stark beat off competition from Citizen Kane and Sideshow Mel to win outright. John Hopkins University have gone a step further in their Alumni Reunions. This time, you can choose your very own ‘Fantasy Dream Team’ of who you want to be reunited with. Powered by social channels, this tactic draws from the popular trends of creating your own fantasy sports teams. Who would you invite? This is a great idea from Michigan Tech for using an online hub and supporting social channels to generate both funding and community engagement for important research programmes. The basis is that if someone can donate $5 or $10 to a hugely important initiative, they are more likely to be engaged with the work and outcomes. It’s all here – tackling cancer, protecting local trout fish, leading developments in the vehicle and mobility industry. Have a look. There’s a way to go yet but there have been some big successes – finding the funding for mobile medicine in Ghana and generating the full $25,000 to explore sleep disorder (a major contributor to heart disease) are good examples. We wish them luck! This was a double award winner at the 2012 Digital Age Creativity Awards, proving HE can mix it with the major consumer campaigns and win! Click on the link for the case study video. It says it all. A simple idea of creating an app for potential students to develop their own Facebook Timeline of the future – showing all that they can achieve at Ozu, a new Turkish university. Yes, it’s happening. Universities are now creating space on Facebook purely for parents. The University of Wisconsin-Madison has already got over 1,000 parents on board in their very own space – to ask questions, join web chats, get reminders (no doubt the ones their children left in their bags!) and to be convinced of the things they really care about. This ranges from the university’s reputation to some simple reassurance about safety and welfare. If universities are serious about parents as a key audience then this is a logical step, especially as the parent profile is now a social media-savvy one (and mainly on Facebook too). It will be interesting to see just how far this all develops.